The Focus Attendance Board (FAB) add-on is a configurable browser-based module designed to provide an accurate picture of current attendance within your workplace. FAB monitors shifts falling below expected levels via a traffic light system allowing you to configure the percentage of attendance each colour represents. At a glance you can identify where additional resources may be needed, allowing you to move members of your workforce around to meet the varying demands of your operation at any one time. It helps save money, avoids lost or wasted time and negates the expense of calling in temporary agency staff. The FAB refreshes regularly to display shifts in progress, those recently started and those about to start, giving you a rolling, real-time picture of attendance, 24 hours a day. 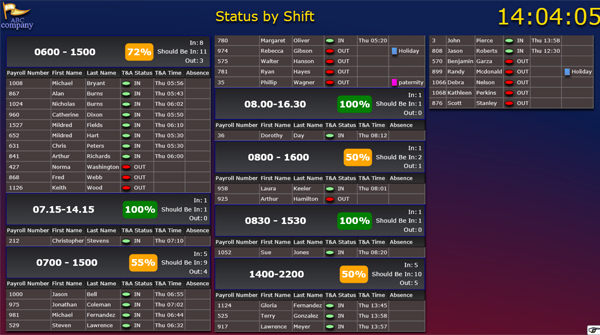 FAB has the ability to display up to 14 different pieces of information for each individual employee. including actual and expected start times, clocked and scheduled cost centres, reasons for absences and more. 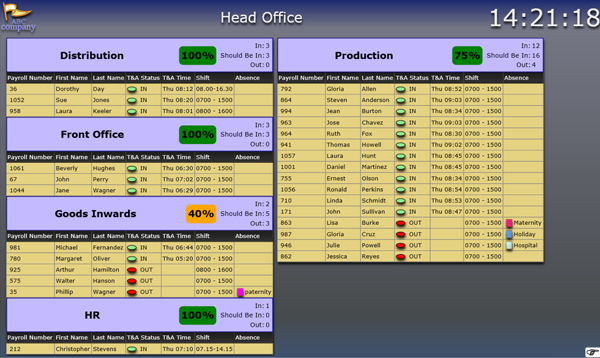 You can even set up and filter different displays for each site, department or cost centre. In addition, a scrolling display updates as the day progresses – so you can see only current relevant information. And with the ability to create multiple screen configurations, you can relay different information to these employees simultaneously.